Scientology’s humanitarian vision takes root in Taiwan with the evolution of Asia’s first Ideal Org. Having clambered to the top of the Great Wall in 1929, Mr. Hubbard observed of the great Chinese culture: “The ages past, there stand to await oblivion which never comes.” Mr. Hubbard’s philosophy would likewise encompass eternity and defeat oblivion, in part because it is derived from Eastern religions of “ages past,” particularly Buddhism. China does endure, and on December 7, 2013, the Church of Scientology memorialized its contribution to that richly woven civilization with the opening of the religion’s first Church—an “Ideal Organization” or “Ideal Org”—in Kaohsiung, Taiwan. Ideal Orgs mark a goal set by Mr. Hubbard to provide the full services of the Scientology religion to its parishioners, while also serving the community with social betterment and outreach programs. Speaking at the inauguration of the Kaohsiung Church, Scientology’s ecclesiastical leader, David Miscavige, completed the circle from Mr. Hubbard’s trek of spiritual self-discovery in Asia 85 years ago to bringing the religion back to China today. “Fulfilling L. Ron Hubbard’s dream of return to Asia in spirit, and giving back the wisdom he glimpsed through a long tunnel of time, all these dreams will now come to pass,” Mr. Miscavige told more than 4,000 Scientologists and well-wishers who attended the ceremony. Scientology came to Taiwan in 1988 with the forming of a mission in Taipei, followed in 1991 by a second mission in Taichung. There were 16 Scientology missions in Taiwan prior to the Ideal Organization dedication in Kaohsiung, whose roots extend to 1992. A milestone occurred in March 2012, when the Church of Scientology released the religion’s scripture in a Chinese translation. The massive 13-story, 108,000-square-foot Kaohsiung Church is the largest Ideal Org in the world. 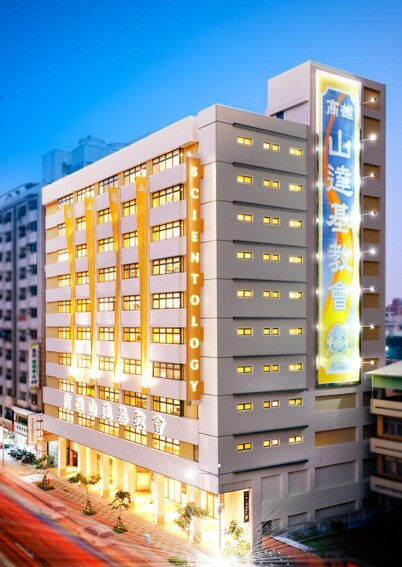 It provides residents of Taiwan with a comprehensive introduction to Dianetics and Scientology, including a vast Public Information Center that chronicles the life and legacy of the religion’s Founder. It is also the center for the Church’s ambitious human rights and drug education initiatives. During the more than two decades that Scientology has been a growing force in Taiwan—whose government recognized the Church as a religious institution in 2003—Scientologists’ tireless efforts to bring peace and spiritual understanding have been on prominent display. For instance, as school officials continued to turn a blind eye to the wrenching impact of schoolyard bullying in Taiwan eight years ago, Scientologists Simone Hsu and Fenny Lee made it their mission to stop the violence. Their weapon of choice: distribution in schools and human rights organizations of Youth for Human Rights booklets, laying out fundamental civil rights. “Something had to be done to protect these kids from each other,” Hsu said. That “something” was the Chinese Association for Human Rights, founded by Hsu and Lee in October 2007 to shake up the status quo. Their ultimate purpose was to teach human rights in schools via the distribution of booklets, videos and other educational materials from the Youth for Human Rights program, supported by the Church. As a result of their work with the Ministry of Education, over 450,000 students across the country have seen human rights films. There is also the Church’s ambitious drug education program, launched in Taiwan in 2000 and centered on the Truth About Drugs education initiative. While drug abuse in the nation has grown—particularly with heroin, methamphetamine, ecstasy and ketamine—so, too, has the Church’s work to educate young people to the negative consequences of drugs. Scientologists have delivered lectures to 750 schools, to an average of 15,000 students annually, and have distributed some 700,000 Truth About Drugs booklets. Dr. Oliver Hsueh, the executive director of the Kaohsiung Church noted, “As we grow, it has been our honor to provide assistance to all corners of Kaohsiung, be it through human rights, drug education, morals education or criminal reform.” The human rights and antidrug campaigns in Taiwan are emblematic of the accomplishments generated by Scientologists world over. “L. Ron Hubbard in his early travels perceived geographic and cultural barriers that block Mankind’s ascent to freedom,” Mr. Miscavige said in an interview after the Kaohsiung inauguration. “He watched with dismay the wealthy European enclaves in Shanghai walled off from awful poverty in China.